A Fat Girl's Ironman Journey: Memorable Tri uh, er, wet , Du-ish??? Memorable Tri uh, er, wet , Du-ish??? I started watching the weather reports last Sunday; I noticed that the temp was going to drop significantly for this weekend. Then, I noticed the “WINDY” mark on the forecasts. As the weekend approached, the “Wind” landed in Pittsburgh. I saw many of their posts on FaceBook and it started to freak me out, so many people lamented about how crazy the wind was. I knew the Pittsburgh weather would be in New England for Sunday AM. I awoke at 4:30 AM for the tri. When I let the dogs out, I heard the howling of the wind, noticed the bent over trees, and then was suddenly hit with the frigid air. The Air temp was a balmy 35 degrees when we left the house!! I’ve never really had race anxiety, I was a bit concerned about swimming in 62 degree water, but I knew I could deal with it for a short ¼ mile. It was the wind and the bike ride that was starting to freak me out. Winds were 17 mph with gusts from 30-50mph so the Weather Channel said! We entered Hopkinton State Park about 6AM, early enough to get a good parking spot and a good spot in the transition area. As the transition area filled up, I got colder and colder. Luckily it was sunny out! Looking over to the water showed not only whitecaps but waves that one might consider jumping over in a jet ski. I couldn’t believe how crazy I was to get in the water, then ride a bike in this! I figured that Karma is after me somehow, or that someone just has a sense of humor and wants me to have these crazy things to write about. The race director explained that the “square” course would become a “triangle” - - we would swim out and round the RIGHT buoy instead of around all of them. As the Elite wave rounded the buoy we watched as the two buoys get closer together! Then the race director came to us and said “ok don’t go around it, just tag it.” – Then it came time for my wave “white caps” to get in the water. 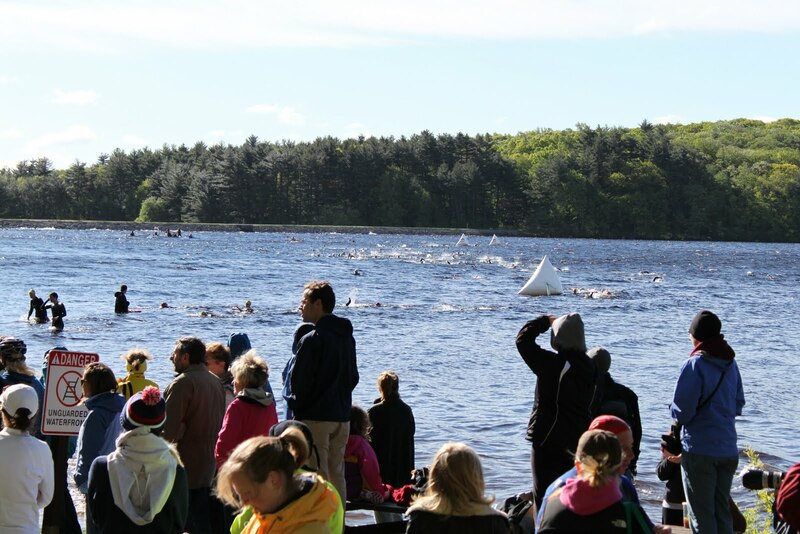 This race is a “Deep Water” start, you wade out to over your head, then you go about 2 min after the wave before you. We got out to our destination IN The cold water, and then the race director yells over the PA “we’re on a hold while they get a few athletes out of the water.” At this point I actually saw a kayak flip over in the wind, I actually thought he was screwing around. Next we saw the volunteers putting ‘caution’ tape across the start line on the beach. NOT a good sign.. A good 8 minutes later, while we were just treading water, the director says “ok, white, please come back.” By this point we had drifted/were blown a good 50 yards away from the start. We thought they were going to make us stand out of the water while they continued the “hold.” We argued that we wanted to stay in the water rather than be WET/COLD while waiting. Then another min later, the “swim” was canceled. We were told that we’re only going to do the Bike and Run. In my opinion, my wave got the short end of the stick, sure it was canceled, but we had to sit in that cold water for nothing! The bike was pretty hilly, and I don’t know how possible but 95% of it had either a head wind or side wind. I literally just started laughing at the absurdity of it all. I saw lots of rescue vehicles while on the bike, but really had no idea what they were doing until the race was done. The run was pretty funny too. Much of it was in the park and was nice, but there were some exposed areas that were, well just hilarious! I’m glad I’m an ahhem “sturdy gal”, or I might have blown away! There is a large viaduct that sits about 100 feet above the water, the winds were just GUSHING through there; it was all I could to do stay on my feet! I did feel bad for those tiny runners; I thought I might have to go capture one from the water! At one point my pony tail was out at a 90 degree angle! On a good note, John brought the dogs and they had a ball, I don’t think they’ve had that much attention in years! Rick had his best Run time for a Sprint! And Nicole – on her Debut Duathon placed second in her age group and First in the Newby category! Way to go Nicole and Rick! **note to my friends that are considering Triathlons, these past 2 weekends are NOT THE NORM, I have no idea what’s going on :) - Murphys Law, or well Kevin Called Me SchlepRock! It was warm and sunny in Sudbury! LOL. Only kidding, I don't think I dried off until the run and it took me all day to warm-up. Good think "Flat Stanley" wasn't with you. Play the Cards You're Dealt! Ehlers Danlos - You can have it and be "mild"
Don't Judge a Book By Its Cover.. I am an IRONMAN! Nothing is wrong with you because I don't see it! Anything is Possible - No Excuses! Former Athena: Now Hot, Tire-flipping, Momma!